Well Autumn has well and truly set in here in Canberra, and I find myself cooking a lot of hearty, warming, comfort foods. This concoction was the perfect blend of creamy rice, buttery mushrooms and parmesan cheese…and was a fantastic dinner, or lunch for any leftovers (if there are any!). 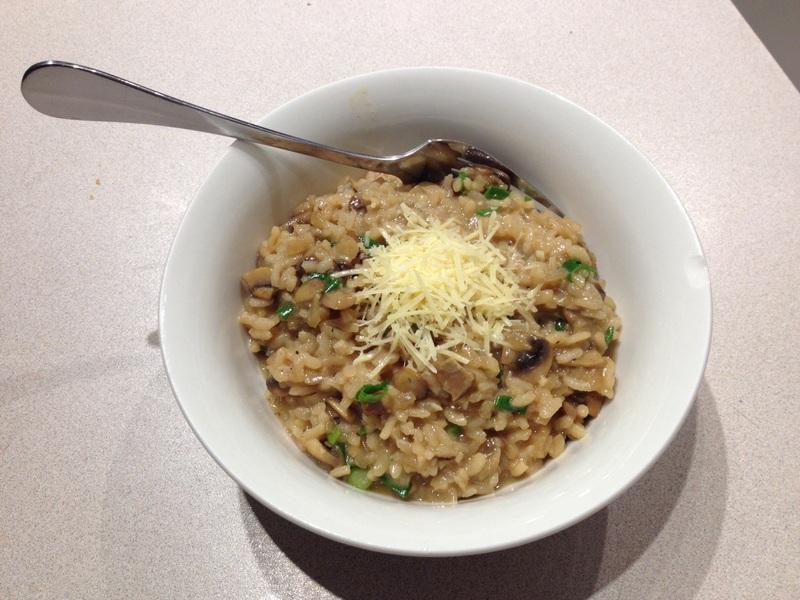 I purchased some dried porcini mushrooms this week and added them to the risotto…definitely gave it a beautiful flavour and added a rich colour, but you could easily leave them out if they are unavailable. Most supermarkets and deli’s stock dried porcini mushrooms, and they can be added to lots of dishes to add flavour. From start to finish this risotto takes about half an hour to cook, so great for a weeknight dinner if you are short on time! Give it a try…I promise you won’t regret it! 1. Put porcini mushrooms in a mug/bowl, add 1 cup boiling water and let re-hydrate for 5-10 minutes.Once soft take out mushrooms and put to one side. Keep the mushroom liquid, ensuring you leave the gritty bits at the bottom of the cup and not in your risotto! 2. Place large saucepan over medium heat and bring stock to the boil. Once boiling reduce heat to low and keep simmering. 3. Place a large frying pan over medium heat and add 2 tbsp butter and 1 tbsp olive oil. Add button mushrooms and saute for 3-5 minutes until golden brown and soft. Place mushrooms in bowl to one side. 4. Add 2 tbsp of olive oil to frying pan and cook the onion until soft and golden. Add garlic and cook until fragrant, about 1 minute. Add rice to pan and stir through oil, onion and garlic until well coated. 5. Add the white wine to the rice mixture and cook until reduced. Once all wine is absorbed, add the porcini liquid to the pan, ensuring you leave the dregs of grit in the bottom of the cup. 6. Once all porcini liquid has been absorbed, slowly start adding the stock, one ladle at a time. Give the pan a good shake in between each addition of liquid, and stir occasionally to make sure nothing sticks to the bottom. Keep adding your stock a ladle at a time for 10-15 minutes, or until your rice is al dente, or firm to the bite. It shouldn’t have any floury or chalky texture, but should still hold it’s shape and be firm. 7. Add the mushrooms to the rice and stir to combine. Add 1/2 cup parmesan cheese and spring onions and stir until cheese has melted. 8. Serve risotto topped with an extra sprinkle of parmesan cheese and some chopped parsley (if you like). You could always add different herbs to this – basil or thyme would work really well with the mushrooms.